Since 2003, SABA has been collaborating with the USFS and the Clay County Communities Revitalization Association to develop a trail system off of Jackrabbit Road in Clay County, NC. This is located on a peninsula on beautiful Lake Chatuge, on the NC/GA border. Close to 15 miles of machine constructed singletrack trails are complete and based on a stacked-loop design. The 3.1 mile Central Loop is the “core” trail that all other optional trails are connected. Many of the trails border Lake Chatuge, while others meander through the woods or ridge-top. These trails were specifically designed to appeal to all skill levels, beginner to advanced. It remains a work-in-progress, with signage, maps, parking lot facilities (pavilion/restrooms/information board) being planned, along with optional technical trail features (TTF’s). Proceeds from SABA fundraising events help benefit the progression and future maintenance of this project. accordance to IMBA standards of sustainable trail building. Read our Trail Committee Policy here. In the summer of 2001, the Clay County School System added mountain biking to its Pathways After School and Summer Program. Members from the local bicycle club volunteered to teach the students about bicycle safety, skills and etiquette in an effort to promote this sport as a lifelong activity while simultaneously fostering health and fitness. During this time, the need for an easily accessible trail system for all skill levels was recognized. Collaboration began between the Southern Appalachian Bicycle Association (SABA), the Tusquittee Ranger District of the USFS, and the Clay County Communities Revitalization Association (CCCRA) to construct such a trail on a peninsula off Lake Chatuge on the North Carolina/Georgia border. The construction of this trail, located within the Nantahala National Forest, soon became a community effort that included involvement of Clay County Schools, Clay County Health Department, area business, and various community organizations. This mammoth task crossed over county and state lines to neighboring communities as awareness of this trail system’s impact became evident. The Jackrabbit Trail Project involved committed organizations who shared common goals: to promote mountain biking and hiking for recreation and fitness to all ages and skill levels, to promote mountain biking and hiking not only for a single community but for a region, and to help promote environmental conservation and “green” tourism. Small western North Carolina communities do not have large corporate sponsors to help with the funding of projects such as this one. Our community has always been reliant on the populace of our residents to pitch in and accomplish such goals. SABA members and others spent countless hours flagging and clearing the trail path in order to reduce the construction costs of machine construction. In addition to seeking potential grant sources, multiple local fundraising efforts began. Monetary and physical donations by the areas small business leaders provided crucial gains in this project’s progress. An example of the role played by small businesses was demonstrated by the clearing and grading of a 400 foot parking area, as well as community labor to construct a bridge. Financial donations were provided by both the Clay County, NC and the Towns County, GA Tourism Associations, illustrating the regional impact. The students from the Pathways Program pitched in to help with fundraising efforts. Educational ventures also took place when students from both Clay and Cherokee County Schools conducted ‘senior projects’ on the process of sustainable trail building. Thoughtful planning by all partners was a crucial step in the success of this trail system. Enlisting the involvement of a professional trail builder was a key component in designing a trail with good flow that would meet the established goals and requirements. November 2005 marked a milestone in the trail’s development with the beginning of ground breaking trail construction. This start was initiated during a visit by the International Mountain Biking Association (IMBA) Trail Care Crew, who was responsible for teaching community members the basics of sustainable trail building. The final trail in this phase was completed in August, 2008. Since that time, the area has also been enhanced by the addition of picnic tables, information board, and entrance and junction signs. The Jackrabbit Mountain Bike and Hiking Trails system is an ongoing project. With close to 15 miles of trail completed thus far, the next goal is to create more mileage including a connector trail that will tie these trails to its neighboring campground. Future plans also include the addition of restrooms, a pavilion and a bike wash station. Eat Smart Move More North Carolina recently awarded grant funding to Clay County to promote increased physical activity through mountain biking. A skills trail will be constructed at the Jackrabbit trailhead, which will have optional technical features designed to help build cycling skills, such as balance. This trail is expected to be completed by the Grand Opening date of April 30, 2011. We update our local trail conditions at Trailforks. You can rate trails, share, and plan your rides as well! SABA Members get 10% off at Blairsville Bikes & Hikes in Blairsville, GA! 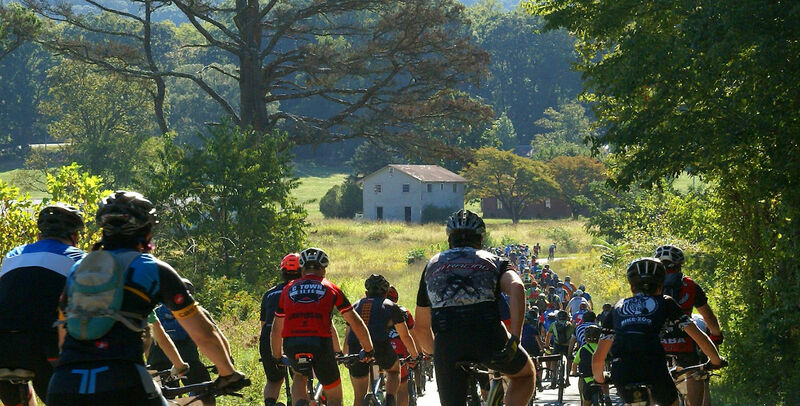 The Southern Appalachian Bicycle Association is a 501(c) (3) nonprofit organization and donations are tax deductible. Federal Tax ID #37-1475059.